So: who screwed up? 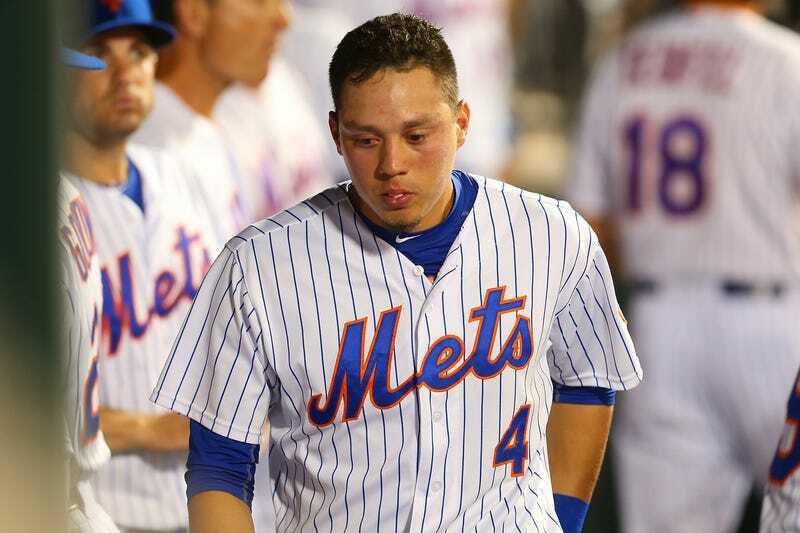 Who was responsible for Wilmer Flores’s tears, and for the Brewers’ goodbye messages to Carlos Gomez, and for the Mets becoming a punchline yet again? And who’s to thank for the most entertaining sports Twitter night since DeAndre Jordan? We know now that the trade—Gomez to New York for Flores and Zack Wheeler—was scuttled over the Mets’ concerns over Gomez’s hip, which has bothered him this season but hasn’t sent him to the DL. “I can’t get into any of the physicals,” [Brewers GM Doug] Melvin said late Wednesday night in a telephone interview, before the Journal Sentinel learned it was concern over Gomez’s hip that nixed the trade. “I was confident the deal would get done, but there was a level of discomfort that came up and so it didn’t work out. This sort of thing does happen: trades are agreed to, sometimes even announced, before hinky medical records scare one side off. But what happened last night was something new and bizarre, a realtime glimpse of a trade being pulled off, then coming apart, and following every confusing turn on Twitter well before the players actually being traded were made aware of what was going on. In Flushing, word of the trade spread around the fifth inning. Nearly every baseball writer had the same information, so it had been leaked by someone high-placed in either the Mets or Brewers front office, or an agent of one of the players involved (and Scott Boras, Gomez’s rep, has had a lot to say). We don’t and probably won’t know who leaked it. But once the writers reported it, it was mere minutes until everyone in the stadium knew. “I just heard it from the fans,” Flores said. Yet the Mets clearly knew the trade was not official, or they would have removed Flores from the game. Manager Terry Collins said he left Flores in because no one had told him about any deal. This was a failing on somebody’s part—if the Mets front office believed the trade was going to go through, they should have taken Flores out and spared him the emotional scenes of his seventh-inning at-bat and eighth inning tears. It was unfair, but understandable, that Flores didn’t learn of the move directly from the Mets—that sort of thing has been happening for decades. It was unfair and unconscionable that once he knew, he had to keep playing. Mets GM Sandy Alderson was the first to officially declare the deal dead. And he did so by shifting the blame away from the Mets. “I know there was a lot of speculation over the course of our game about a possible trade. There is no trade,” Alderson said. “Unfortunately, social media, etc., got ahead of the facts and it may have had an adverse effect on one of the players rumored to be involved. It was an unfortunate situation. To be clear, this was not “speculation.” The Mets had agreed to ship out Flores and Wheeler, until they carefully examined Gomez’s health and changed their minds—which they had every right to do. But the blame lies not with the reporters who had been told about the agreement, and it certainly doesn’t lie with “social media [getting] ahead of the facts.” If Sandy Alderson truly believed there was no deal being done, or if he had wanted to close the barn door before all the horses had run off, he could have done it in minutes, with a few phone calls to beat writers, and hey, maybe one down to the dugout so someone could have reassured Flores. But everyone else, from the players to the reporters to the agents to the Brewers, believed this trade was going to happen. Even pending the medical records, it was a safe bet to be consummated. This was one of those rare times the bet didn’t pay off. It was a combination of bad luck and poor timing and instant communication and a failure to communicate on Alderson’s part that resulted in correct-but-preliminary information overflowing the proper channels. It was a perfect storm, and there was no malice exercised on any side. Just—as usual—a little bit of incompetence.